Aden Boyd and Nancy Sykes Boyd were among the pioneer settlers of Berrien County, GA.
1. Blansett “Blanche” Boyd, born 1823, married Henry Tison. 2. David Boyd, born 1827, married Anna Ford, October 27, 1858. 3. Aden Boyd, Jr. born 1829, married Maxie Cook, daughter of Elijah Cook and Sarah “Sallie” Webb. 4. Lucinda Boyd, born 1832, married William Baldree, September 9, 1857. 5. Sarah Boyd, born 1835, married Robert Lewis Taylor. 6. Mary E. Boyd, born 1836, married Elbert J. Chapman. 7. Eliza H. Boyd, born 1838, married William J. Taylor, Jr., July 29, 1862. 8. William H. Boyd, born 1841, married – Tyson in Florida. 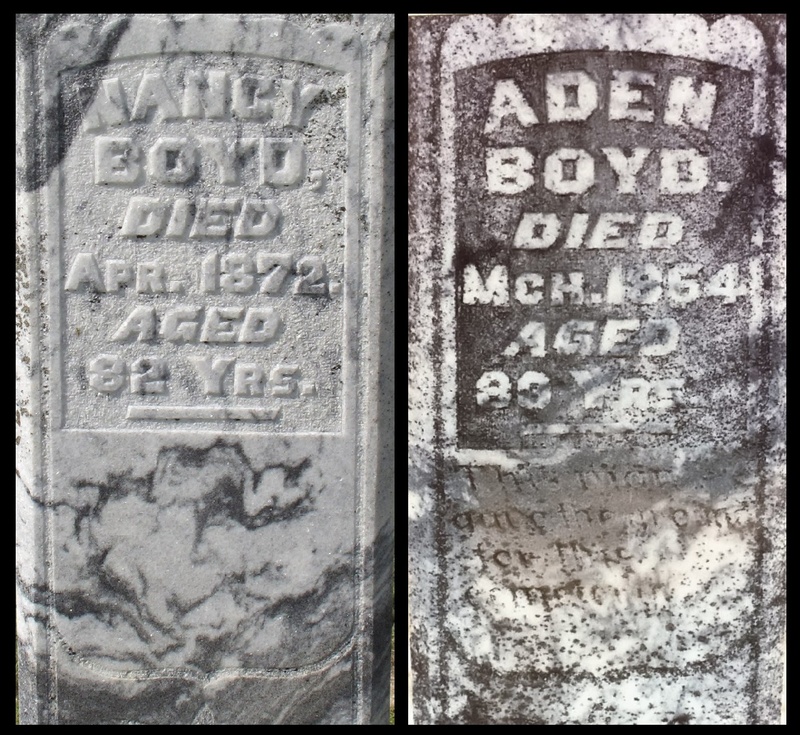 Aden Boyd(1784-1864) was a son of David Boyd and Sarah Dabney. His father “was a Revolutionary soldier, enlisting in Culpepper County, VA, in Captain Ladson’s company, later being tranferred to Captain Clark’s company and serving under General Benjamin Lincoln at Charleston and Augusta” in the 1780’s. After the Revolution, David Boyd RS settled in Old Washington County, GA. His property there was later cut into Montgomery and Tattnall counties. Aden and Nancy Boyd made their home in Appling county, and are documented as residents of Appling County in the Census of 1820. In 1823 the couple had their first child, a daughter they named Blansett. Around that same time Aden’s parents both died, passing within a month of each other in Tatnall County, Ga. When the Georgia legislature created Ware County in December, 1824 Aden Boyd’s home was cut into the new county. On July 11, 1826, Aden Boyd purchased lot #155 in the 8th land district of Ware County, near a railroad stop known as “Old Nine” or “Number Nine”- a lot now within the city limits of Waycross, GA. Aden Boyd sold this lot to Jeremiah Walker on Sept. 24, 1827. About 1827, a son was born to Aden and Nancy Boyd. They named the boy David Boyd, after his paternal grandfather. Around 1828, Aden Boyd moved his family to Old Lowndes County, where he established a home in the portion of the 10th land district which in 1856 was cut into Berrien County. It appears that Aden’s brother, Bani J. Boyd, and nephew, Henry Boyd came to Lowndes from Tatnall County about this same time and settled nearby. In 1829, Nancy delivered another boy and the couple named him Aden Boyd, Jr. In 1830, Aden Boyd and his young family are enumerated in Lowndes County. They were originally members of Union Church which they joined on professions of faith, he being baptized November 12, 1831, and she on January 7, 1832. Mr. and Mrs. Boyd were neighbors of Dred Newbern and Jonathan Sirmans. Nearby were the homesteads of Bani J. Boyd, and Henry Boyd. The census shows that Aden Boyd did not own any slaves at this time. Over the next eight years, four more daughters were born to the couple, Lucinda B. (1832), Sarah B. (1835), Mary E. (1836), and Eliza (1838). County deed records show that on February 22, 1839, Aden Boyd purchased land from Levi J. Knight, original settler of Ray City, GA . This land was a part of lot 356, 10th district of what was then Lowndes but now Berrien County. By about 1845, Aden and Nancy’s eldest daughter, Blansett Boyd, married Henry Tison and settled with her husband on a farm next door to her parents. The Agricultural Census of 1850 shows Aden Boyd owned 735 acres of land, 40 acres of it improved. The cash value of his farm was $400, and he owned another $50 in farming implements and machinery. His livestock included 3 horses, 20 milch cows, 24 other cattle, and 100 swine. The total value of his live stock was $460 dollars. He had 300 bushels of Indian corn and 40 bushels of oats. He had 1 bale, 400 lbs, of ginned cotton; 50 bushels of peas and beans; 20 bushels of sweet potatoes, 50 lbs of butter, and $125 dollars’ worth of slaughtered animals. His neighbors were John F. Clements and Henry Tison. Nearby was the farm of Aaron Knight, and his family. About 1852, son Aden Boyd, Jr married Maxie Cook, daughter of Elijah Cook and Sarah “Sallie” Webb. Aden and Maxie settled on a place next to Stephen W. Avera, father of William Greene Avera, and the neighboring farms of William H. Boyett, Moses G. Sutton, Elijah Cook, and Mark R. Watson. According to Folks Huxford, Aden and Nancy Boyd had continued as members of Union Church but in 1854, with their children marrying and settling around them, “a meeting-house was erected on the Boyd lands called Boyd’s Meeting House. Aden Boyd gave land for a church and cemetery, and a new church called Empire was organized there. Empire Church is located near Five Mile Creek, about six miles northeast of Ray City out the Sam I. Watson Highway, on Empire Road. Mr. and Mrs. Boyd became charter-members of Empire Church by letter of transfer from Union Church dated March 11, 1854.” He and his wife continued as members at Empire for the rest of their lives. On Feb 4, 1856, Aden Boyd and his sister, Mrs. Blansett Jones (wife of Abner Jones of Berrien County) Filed an application in Lowndes county for a pension as orphans of a deceased Revolutionary Soldier. Their pension application was denied since they were both adults with families of their own at the time of their father’s death. Aden Boyd was one of the early rice growers of Berrien county. The Berrien County agricultural and manufacturing records for 1860 show he had on hand 80 pounds of rice, along with 50 bushels of corn, 10 bushels of oats and 5 bushels of peas and beans. By 1860, Aden Boyd kept a farm of just 100 acres for himself. Of this, 15 acres were improved and 85 unimproved. The land was assessed at $400, and his home furnishing were worth $5. His livestock consisted of one mule, two sheep, and ten swine, altogether valued at $100. In 1860, Adin Boyd and his wife Nancy were living in Berrien County. His daughters Sarah, and Eliza H., and son William H. were enumerated in his household. His neighbors were William G. Aiken and Henry Tison. 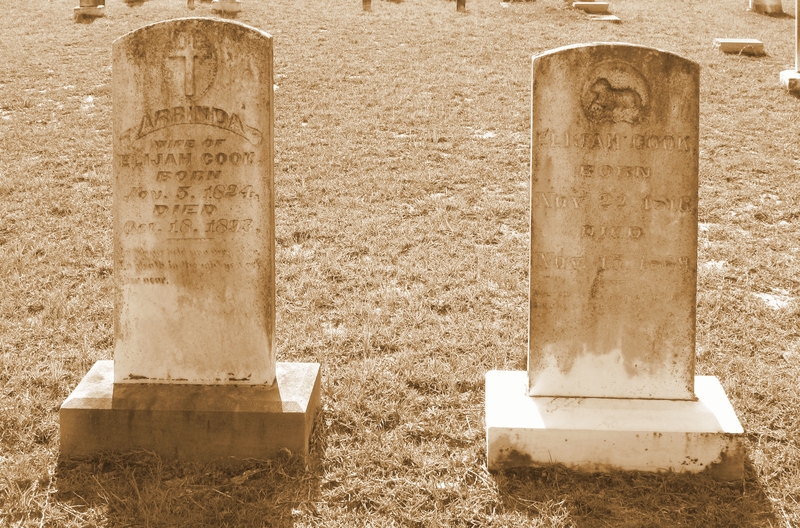 Aden Boyd died in April 1864, and was buried in the cemetery at the church he helped to found. Nancy Sykes Boyd died in April, 1872 and was buried in the cemetery at the church. In 1857, daughter Lucinda Boyd married William Baldree, and the couple made their home adjacent to her parents and siblings. The following year, David Boyd married Anna Ford and they also made their farm near his parents’ home place. 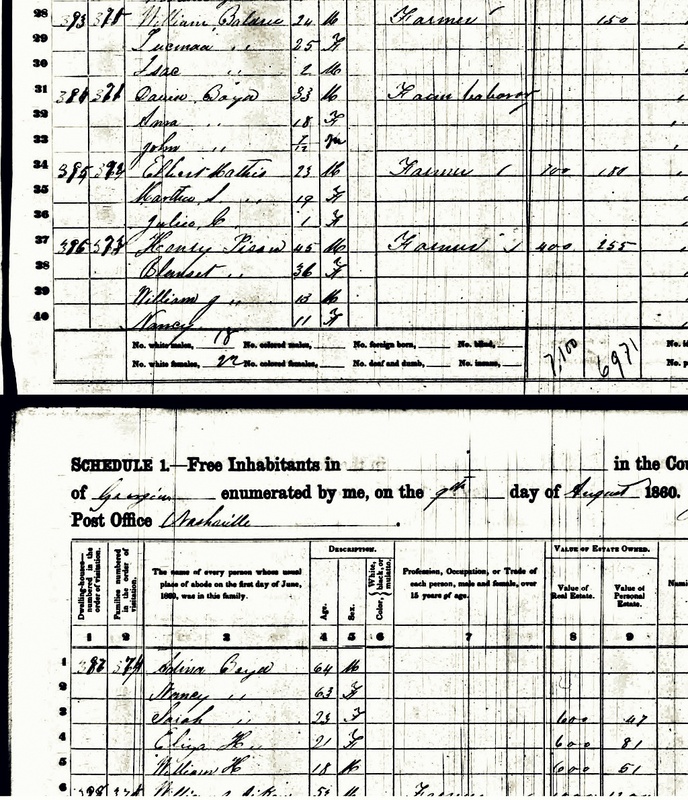 1860 census pages showing households of Aden Boyd and Nancy Sykes Boyd; Henry Tison and Blansett Boyd Tison; William; William Baldree and Lucinda Boyd Baldree; and David Boyd and Anna Ford Boyd. In June of 1859, Aden Boyd’s daughter Mary Boyd, married Elbert J. Chapman who was known locally as “Old Yeller” because of his pale complexion. During the Civil War Old Yeller enlisted with Levi J. Knight’s company of Berrien Minute Men, and served in the 29th Georgia Regiment along with William Washington Knight, John W. Hagan and other men of Berrien County. But Chapman grew frustrated with relegation to a rear position and abandoned his unit to seek action with a westbound cavalry unit. Although Chapman fought bravely with his new unit, he was eventually shot for his desertion from the 29th Georgia Infantry. Mary Boyd Chapman was later denied a Confederate Widow’s pension. Sarah Boyd and Eliza Boyd married two brothers, Robert Lewis Taylor and William J. Taylor, respectively. They were brothers of Jemima Taylor, who married William Boyette. The youngest son, William H. Boyd, married around the end of the Civil War or shortly thereafter. According to Folks Huxford, he married a Tison woman in Florida. The 1870 census provides her given name as “Georgia A.”, but no Georgia Tison has been located. In 1870, William H. Boyd and wife Georgia, along with their sons Henry Harrison Boyd and Thomas H. Boyd, were making their household in the 1144 Georgia Militia District, the “Rays Mill” District of Berrien County, GA. They were next door to William’s sister Blansett “Blanchy” and her husband, Henry Tison. Also living on the next farm was William’s widowed sister Mary Boyd Chapman, with her 8-year old daughter Mary A C Chapman and an infant daughter, 7-month-old Cressey Chapman. 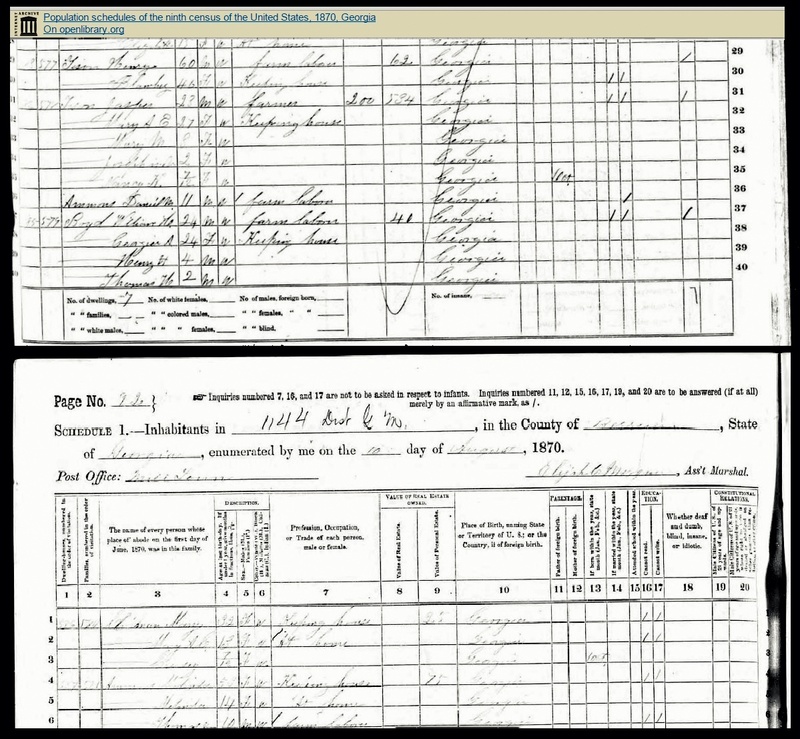 Pages 91-92 of the 1870 Census of Berrien County, GA showing the adjacent households of Blansett Boyd Tison & Henry Tison; Jasper Tison; William H. Boyd & wife Georgia with sons Henry Harrison Boyd and Thomas Boyd; and Mary Boyd Chapman with daughters Mary A C Chapman and Cressey Chapman. By 1880 William H. and Georgia Boyd had moved to the 1058 Georgia Militia District in Echols County, GA. They were enumerated there with their son Harrison. Also in the Boyd household was William’s sister, Mary Chapman, and her daughter Cressey Chapman. 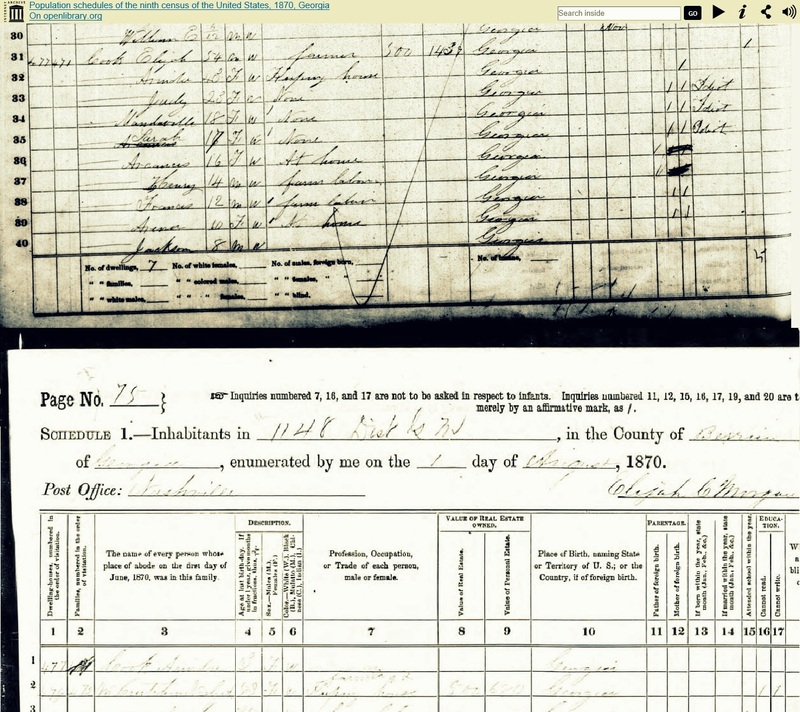 1880 Census, Echols County, GA, enumeration of the household of William H. Boyd & wife Georgia with son Henry Harrison Boyd, sister Mary Boyd Chapman, and niece Cressey Chapman. It appears that Georgia Boyd died shortly after 1880 and that William H. Boyd remarried. 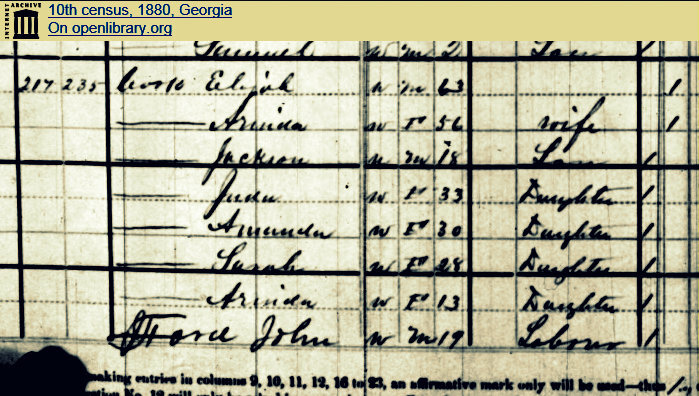 William H. Boyd, himself, apparently died before 1900, but his second wife, Penny Boyd, appears in the Valdosta, GA household of his adult son, Harrison Boyd, along with her minor children in the census of 1900.